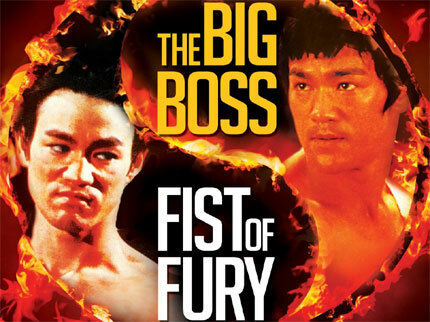 Severin films feeds the appetites of action movie buffs once again with their second part of “Kung Fu Trailers of Fury.” The region free Blu-Ray comes packed with over two hours over kung fu movie trailers that also delves in to comedy, animation, and drama, even. There are thirty five trailers total that skim over the massive landscape of Asian cinema, and fans will be very pleased to indulge in an uncut look at some of the best and most noteworthy films in the sub-genre. While the trailers aren’t all at even volume, with most of them presenting louder or softer volume as a whole, the trailers are offered in their original aspect ratios. The beautiful but deadly Cynthia Rothrock is back with another of Full Moon’s great compilations entitled “Fists of Fury.” At a little over a hundred minutes, “Fists of Fury” features clips to a ton of famous and infamous martial arts films that tackle all kinds of topics far and wide. There’s “Female Fighters,” the funny but awkward “Brucesploitation,” and “Deadliest Weapons,” movies with some of the most unusual and dead weapons in all of action cinema. It’s hard to express why I love Berry Gordy’s “The Last Dragon” so much. I have loved it for years ever since I was a small child and used to watch it religiously on network television every time it came on. Perhaps it’s the minority hero, perhaps it’s the Bruce Lee idolatry, who the hell knows? With “The Last Dragon” I stopped asking why I loved it a long time ago and just embraced it as one of my all time favorite action films. Yes, I said it’s one of my all time favorite action films. It’s not just a film but it’s an experience to boot. Taimak’s performance as Bruce Leroy is just so genuine and fun it’s hard to really rag on his presence here. When I was a very young, I grew up in front of the television. Not because my parents insisted on it, but because I was a bonafide TV addict. Growing up, I knew two things about television. One was that Adam West’s “Batman” was a great series, and that “Green Hornet” was the much more sophisticated and entertaining counterpart that was disgustingly underrated. I didn’t grow up with either series since I was born in 1983, but back when local networks played classic programming during the day, “Batman” was a surefire choice of entertainment after school for many years. “Same Bat Time! Same Bat Channel!” always kept me coming back to see how Batman or Robin would get out of a jam. During that time, I fondly recall watching “Green Hornet” on VHS and found it to be much more entertaining and exciting. Bruce Lee is a legend beyond the mere definition of legend, and likely his most accessible and easily found film is “Enter the Dragon.” That’s pretty much because Lee stars in a film that garners the most mainstream premise along with some truly iconic imagery that’s never been matched. Even in spite of battling Chuck Norris in one of his films. “Enter the Dragon” is an easily found film that’s on constant rotation in American television mainly because it’s a truly entertaining film that can appeal to almost anyone. It’s a crime thriller, a martial arts film, a romance picture, and a revenge film all tied in to one. This year Shout! Factory gives fans of Bruce Lee the chance to join together the release of “I Am Bruce Lee” with two DVD’s featuring four of his best films, and for fans looking for a complete library from Lee, Shout! Factory more than obliges. One of many early dark films stars Lee as Cheng in “The Big Boss,” a rather violent and historic action picture filled with much mythos and urban legends about the production, including the famous alleged on-set battle that ensued when a supposed extra challenged Lee to a fight. Shout! Factory continues its celebration of the one and only Bruce Lee by offering fans their chance at one of two double feature DVD sets that feature some of the best international entertainment starring Lee. 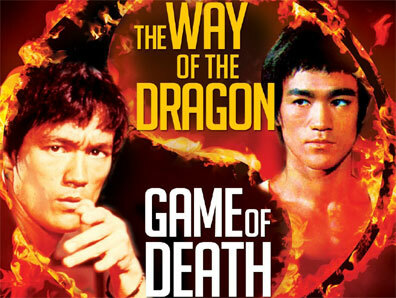 With the newest 40th anniversary release of “Enter the Dragon” around the corner, Shout! Factory gives fans their own Bruce Lee fix with new releases of some of his most iconic movies. 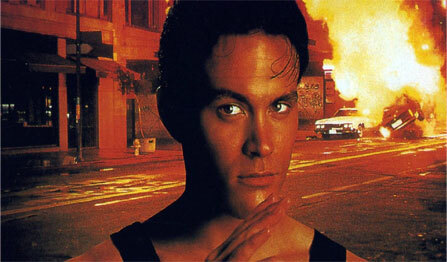 After cameos in “Kung Fu,” a still laughable premiere in “Laser Mission,” and shifting out of the shadows of bigger names in “Showdown in Little Tokyo,” Brandon Lee finally garnered his own action vehicle in 1992. Whether you like, love, or hate the movie, there’s no denying Brandon Lee had what it took. With the fading mold of the action star becoming an antiquated concept in modern cinema, Brandon Lee had the chops to become a bonafide film star who could have built himself an empire in the same way Michael Douglas did by straying from the legacy of his father Kirk Douglas.